Akpoha, like other communities in Afikpo North Local Government Area of Ebonyi State, has some mineral deposits. It is a small community near Afikpo. The people of the area are homogenous and predominantly farmers. In March, a business deal was allegedly sealed between the people and a mining company, Asphalts Unity Construction Limited. The two parties signed a Memorandum of Understanding (MoU) for lease of a portion of the land for mining purposes. Then both parties allegedly agreed that the lease would last for 25 years. The parties also agreed that N19 million should be paid to the owners of the land affected by the lease. The money was a compensatory payment for the piece of land acquired by the mining company. Last week, the N19 million compensatory payment was shared to the people at the community’s village square. The money was given to a prominent stakeholder in the area, Chief Christopher Omo-Isu, pending when it would be shared. Omo-Isu, a former member of the House of Representatives representing Afikpo North and South Constituency, disclosed that the business deal was sealed on March 3. He said: “On March 3, 2018, the community gave me N19 million for safekeeping. I kept that money and today, they requested for the money. The entire people are here to share it. This money was paid to them by Asphalts Unity Construction Limited and today, they decided that they must share it. We have two communities here – Amata and Amogu – that make up Akpoha clan. He urged the people to continue to love one another and not to allow mischief-makers to bring disunity among them as, according to him, such will not bring development to their land. Breaking the figure down, the Chairman of the Adhoc Committee set up for that purpose, Chief Igwe Philip, narrated that commencement fee was N12 million, while annual land rate was N7 million totalling N19 million. He said: “You know that the memorandum of association stipulates that 70 per cent of this money goes to the land owners, then Akpoha clan gets 30 per cent. Before then, there were sundry expenses we made in the course of transacting the business such as payment to surveyors and lawyers who wrote the agreement. Philip also urged the people to continue to love one another and not to allow mischief-makers to bring disunity among them. The traditional ruler of Amata, HRH Peter Ogbuagu, commended the people for conducting themselves orderly during the sharing and urged each community to ensure that every family was adequately represented in the sharing of the money. He also thanked the community for their transparency in handling the money. Chief Francis Ogbuche, another stakeholder in the community, on his part, maintained that Omo-Isu had always represented the community well and that there was peace and unity existing among them which, according to him, was why the money was shared with smile on every body’s face in a public place. The state government, however, faulted the whole thing, saying it fell short of the procedure stipulated for mining in the state. The police later arrested 16 persons in the area including a Lebanese over the matter. The state Police Public Relations Officer (PPRO), an Assistant Superintendent of Police, Ms Loveth Odah, said the arrest was a result of a petition written by some stakeholders in the community over the business deal, alleging that the land in question was in dispute. She, however, declined to respond to critical issues surrounding the matter. The Senior Special Adviser to Governor Dave Umahi on Internal Security, Dr. Kenneth Ugbala, alleged that the company did not comply with the law of the state guiding mining. He said: “It has come to our knowledge that some communities and companies are violating the laws of Ebonyi State government, concerning the procedures of going into mining in the state. Ebonyi State government has streamlined the procedures that should be followed when any company wants to go into mining. First you go through the communities, pass through the local government and you get final approval from the office of the commissioner for Solid Minerals. Ugbala said that it was shocking to discover that during a mere routine check and inspection, they found out that some people had violated the directives of Ebonyi State government. He said: “We are here to make sure the law is maintained. We are here to make sure we get those that are involved and we are here to let the villagers know that when government says this is the directives, that it should be followed. “We equally want the company to know that we are not here to sell the future of our children. Selling all these solid minerals, especially now that government is talking about restructuring, is not right. What is the point of our argument about this restructuring? The oil is drying fast, so they should not think that they will sack the economy and leave empty account for our children in the future. “We want the community to know that when the normal procedure is followed, then they will benefit more. We don’t want some fast individuals in the community to collect money, defraud companies and start using the money they collected to make trouble. So, we are here to make sure there is law and order. On his part, the Commissioner for Solid Minerals Development, Chief Francis Orji, explained that his ministry had sealed the mining site and expressed shock that mining activities were still ongoing after the sealing. He said: “We, as a ministry, had earlier sealed off this place through the office of the attorney general. It is a big shock to us, even me. I’m surprised that equipment and men are already mobilised to commence work in a site that has already been sealed by the ministry in conjunction with the Ministry of Justice. This company has no business being in this place. Also, we found out that the mining lease given to this company is written Onicha Local Government Area. 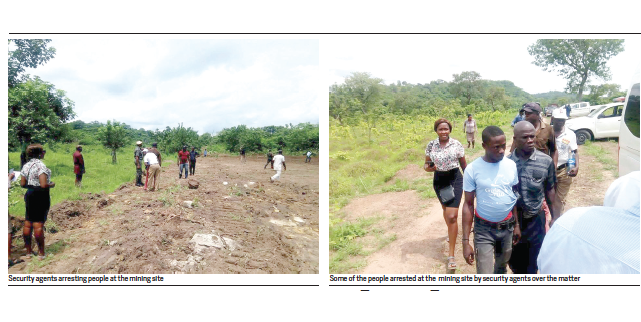 The Coordinator, Amoha Development Centre, Elder David Egwu, alleged that Omo-Isu, alongside some other members of the community, illegally leased the land to the mining company. Egwu noted that the land leased to the company as a farmland belonging to five clans that made up the community thereby making it difficult for them to use their land. He said: “This site is in Amata and we do rotational planting here. We have Onyiagu Ukpa, Ukpa Ezi, Edaka, Nkala Ezi, and alike. The whole of the land they took cuts across this place, which means we have no land to farm. The economy of this land is being damaged. The land over 130 hectares and it has been mortgaged by this people. “Omo-Isu, who is from Amaogu not even from here and some people who are from Amata here, leased the land on March 3. We have written to the state government, the police and to the Department of State Services (DSS). But the most annoying thing is that somebody has lost his life here. Omezue Patrick Okpara, from Amata, in Ezi MBA last month, died because of the sharing of the money. Government gave directives that nobody should enter the land. Omo-Isu, Igwe Ele and others said the governor should not decide for them, which the governor said he is not deciding what happened to community land but let there be peace that he would not want trouble anywhere in the state. Egwu further alleged that the company’s intention was to claim ownership of the land. He disclosed that information which he received was that the company planned ownership of the land, not leased as was presupposed by the community members. He added: “We have five clans and that is how our land is portioned; it is only one kindred that does not have portion of land there. Why should you give the entire land of the village out, thereby mortgaging the future of our people? Again, we had meeting on the 3rd of January and the whole Akpoha general assembly; nobody knew that a company was coming. “On the night of that day, about 9p.m., they went and collected the money, two of them and sold the land. As a coordinator, I’m not aware, government is not aware and government has a law that before any company comes into a community, they must go to them, have meeting and an agreement be reached. But hundreds of people of the Akpoha community had protested and alleged unlawful mass arrest of their kinsmen by security operatives. The protesters made up of aged men and women besieged the premises of the state Police Command, Abakaliki, to register their grievances on the mass arrest. The protesters alleged that the security agents invaded their community, arrested and whisked away anyone they caught over a “lawful mining deal” they entered into with a mining company. Leader of the protesters, Emmanuel Mba Isu, alleged that the combined team of security operatives, including the police stormed the community, harassed and intimidated the villagers, especially women and the elderly. Fuming, Isu said: “Security operatives loaded in three Hilux vans stormed the village and started arresting the residents. We have met with the Police Public Relations Officer with our lawyers. But they said that there is a petition from some persons in the community alleging that the company did not obey government’s rules. We asked; which government’s rule was that? We gave them our agreement with which they got their licence from the Federal Government. If they breached protocols, will that warrant the police to arrest the villagers? Should that not be government versus the company? Meanwhile, a social critic, Justice Okoro, has called on the Economic and Financial Crimes Commission (EFCC) to investigate Asphalts Unity Construction Company Limited and Omo-Isu over the N19 million shared to the community. In a petition, Okoro condemned the movement of the raw cash into the community. He said: “I have asked the EFCC Chairman, Mr. Ibrahim Magu, to investigate Ebonyi State government, Asphalt Unity Construction Company Limited and Hon. Omo-Isu. Let it be recalled that few hours ago, N19,000,000 found its way into Akpoha, Afikpo in Ebonyi State, Nigeria through Asphalts Unity Construction Company Limited. I thank God, I also thank the elders of Akpoha and the entire youths of Afikpo for being disciplined and careful enough not to allow this vanity result to waste of lives and property. “The movement of such huge amount of raw cash contravenes the Central Bank of Nigeria (CBN) monetary regulations and EFCC’s money laundry regulations. I also want to use this opportunity to advise our youths to guard their communities, their lives and their properties jealously from and against the agents of darkness, who are trying to throw our villages into crisis using raw cash in the face of this present economic recession. But a resident of Akpoha community, Ada Omefuru, countered Okoro’s claim. She noted that the money was not paid to Omo-Isu, but to the community for lease of a portion of its land. “This money did not make its way into Ebonyi State a few hours ago. This money is money paid by Asphalts to Akpoha community for the lease of certain plots of land. The money was not paid to Omo -Isu, but was brought on the day the contract between the two parties was executed. “The money was only given to Omo-Isu for safe keeping, pending when it would be given to the legitimate owners,” Omefuru said.